LAKE LINDEN – Marie E. Racine, 97, of Lake Linden, passed away at her home, after a short illness, on January 31, 2017, with her family by her side. She was born on March 7, 1919, in Ahmeek. She graduated from Calumet High School with the Class of 1939. She was a homemaker first, raising her family. Later, she worked as a cook at Dreamland in Bootjack for 25 years. Marie was married to Robert Racine on August 23, 1941, at Saint Mary’s Church in Calumet. He passed away on July 16, 1992. 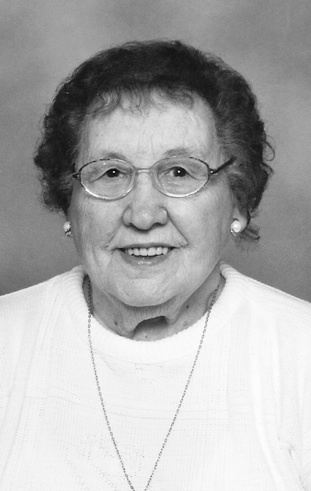 Marie was a member of Saint Joseph Catholic Church in Lake Linden and a lifetime member of the Altar Society. She was active with many groups and clubs and had been volunteer at Stillwaters in Calumet. She loved playing bingo and crocheting towels. She enjoyed crafts and time spent at the camp in Rice Lake. She liked to play card games with her family. She is survived by four children, Ronald (Sandy) Racine of Calumet, Bruce (Pat) Racine of Rockland, Dennis Racine of Lake Linden and Janet (John) Hanner of Houghton; grandchildren, Debbie (Robert) Pernaski of Marquette, Bonnie (Walt) Anderson of Lake Linden, Ron, Jr. (Jennie) Racine of Calumet, Bill Racine of Escanaba, Dan (Becky) Racine of Escanaba, Annette (Justin) Schrank of Greenville, Wisconsin, Alison (Mike) Voakes of New Baltimore; great-grandchildren, Kelly (Adam) Tall of Negaunee, Casey Pernaski of Lansing, Meagan, Annalyse and Meredith Voakes of New Baltimore, Joshua, Marcus, Alayna and Beau Racine of Escanaba, Brandon Ruby of Escanaba and Lincoln Schrank of Greenville, Wisconsin; great-great-grandchild, Jace Tall of Negaunee; three sisters-in-law, Jeri Janzen of Niles, Illinois, Joy Schneller of Niles, Illinois and Gladys Sarazin of Bootjack; and numerous nieces, nephews and cousins. The family wishes to thank Dr. Hafeman and special care-giver, Donna Hodges. The family is grateful to Aspirus at Home for all their care. The Mass of Christian Burial will be celebrated at 11 a.m. on Friday, February 6, 2017, at Saint Joseph Church in Lake Linden, with Fr. Joseph Boakye Yiadom to officiate. Spring burial will be at the Mount Calvary Cemetery in Lake Linden. The Pearce Funeral Home in Lake Linden is assisting the family. Memorials, in lieu of flowers, may be made to Saint Joseph Church, Hospice or the charity of your choice. Online condolences may be left at pearcefuneralhome.com.